To use the remote control, aim it at the transmitter window at either seatback console and press the button. Direct sunlight or very bright light could affect the ability of the RSE transmitter to receive signals from the remote control. Check the batteries if the remote control does not seem to be working. See “Battery Replacement” later in this section. Objects blocking the line of sight could also affect the function of the remote control. If a CD, DVD, or MP3 disc is in the Radio DVD slot, the remote control button can be used to turn on the video screen display and start the disc. The infotainment system can also turn on the video screen display. 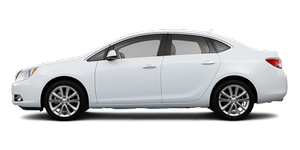 See CD/DVD Player or the separate navigation system manual for more information. Storing the remote control in a hot area or in direct sunlight can damage it, and the repairs will not be covered by the warranty. Storage in extreme cold can weaken the batteries. Keep the remote control stored in a cool, dry place. (Power): Press to turn the video screens on and off. (Illumination): Press to turn the remote control backlight on. The backlight times out after several seconds if no other button is pressed. (Title): Press to return to the main menu of the DVD. This function could vary for each disc. (Main Menu): Press to access the DVD menu. The DVD menu is different on every DVD. Use the navigation arrows to move the cursor. After making a selection press the enter button. This button only operates when using a DVD. , , , (Menu Navigation Arrows): Use the arrow buttons to navigate through a menu. (Enter): Press to select the highlighted choice in any menu. (Display Menu): Press to adjust the brightness and screen display mode, and display the language menu. (Return): Press to exit the current active menu and return to the previous menu. This button operates only when the display menu or a DVD menu is active. (Stop): Press to stop playing, rewinding, or fast forwarding a DVD. Press twice to return to the beginning of the DVD. (Play/Pause): Press to start playing a DVD. Press to pause a DVD while it is playing. Press again to continue playing. Depending on the infotainment system in the vehicle, DVD playback may be slowed down by pressing then . Reverse slow play by pressing then . Press again to cancel slow play. Press to go to the start of the current track or chapter. Press again to go to the previous track or chapter. This button may not work when the DVD is playing the copyright information or the previews. (Next Track/Chapter): Press to go to the beginning of the next chapter or track. This button might not work when the DVD is playing the copyright information or the previews. (Fast Reverse): Press to quickly reverse the DVD or CD. To stop fast reversing a DVD video, press . To stop fast reversing a DVD audio or CD, release . This button might not work when the DVD is playing the copyright information or the previews. (Fast Forward): Press to fast forward the DVD or CD. 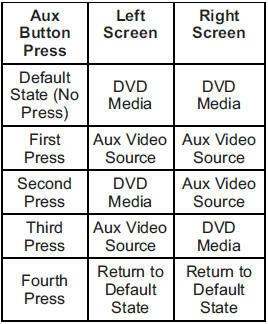 To stop fast forwarding a DVD video, press . To stop fast forwarding a DVD audio or CD, release . This button might not work when the DVD is playing the copyright information or the previews. (Audio): Press to change audio tracks on DVDs that have this feature when the DVD is playing. (Subtitles): Press to turn ON/OFF subtitles and to move through subtitle options when a DVD is playing. AUX (Auxiliary): Press to switch the video display between the DVD player and an auxiliary source. (Camera): Press to change the camera angle on DVDs that have this feature when the DVD is playing. (Clear) (If Available): Press this button within three seconds after inputting a numeric selection, to clear all numeric inputs. 10 (Double Digit Entries) (If Available): Press this button to select chapter or track numbers greater than 9. Press this button before inputting the number. The numbered keypad provides the capability of direct chapter or track number selection. If the remote control becomes lost or damaged, a new universal remote control can be purchased. Use a Toshiba® code set for replacement universal remote controls. 1. Slide back the rear cover on the remote control. 2. Replace the two batteries in the compartment. Remove the batteries from the remote control if unused for an extended period of time.